Join this hands-on session to learn about a new research-based creativity performance assessment. Participants will be provided an opportunity to review, use, and score the new A&W Buttons Creativity Performance Assessment. This new assessment can be considered as a second measure opportunity for school districts that does not require students to draw, write, or possess extensive vocabulary; thus supporting ESL students and providing an alternative approach to that of the Torrance Figural Assessment and the Profiles of Creative Abilities (PCA). Creative, Real-World Independent Projects: Differentiation That’s Fun! Gifted students need high-level choice-based projects that inspire creativity and growth. Teachers need clear student guidance that differentiates in every aspect, structured checkpoints and comprehensive assessments. Learn to challenge and motivate your students year-round while alleviating your workload. View student portfolios, exhibits and photos. Excellent handouts. Leave refreshed with methods to implement right away! Be ready to walk away with multi-standard based lessons and project ideas infused with creativity! You will learn to utilize creativity to push your students deeper into Bloom's Taxonomy and DOK through quadrant D activities. Come experience projects on Bravery Through The Decades, the Trojan War, Shark Tank, Creativity Wars, Tech Fair, and many more. Nurture your students’ curiosity and creativity as you present them with real world situations/dilemmas that require insight, intuition, creative problem solving and collaboration in order to reach effective and accurate solutions. These investigations will allow students to (1) Simulate an engineering team as it searches for solutions (2) Take on the role of lawyers who are analyzing how statistics have been manipulated (3) Become a team of journalists trying to determine why the math in several news articles is incorrect and what the consequences could be. Show students that math is much more than rote learning and formulas. Get your creative juices flowing and have fun while learning some strategies that you can incorporate into your curriculum. We will have various interactive stations around the room where you can experience strategies for developing creativity. Each station will also have information on the strategy as well as how the strategy may be used in different content areas and for different age groups. After 20 minutes, we will indicate that it is time to change, and you will be able to pick another station. This bazaar of creativity strategies may result in some very bizarre sights, sounds, and products, but we hope you will enjoy yourself and get some great ideas for developing creativity in your students. NEW!!! This session will look at the FREE Gifted Eligibility Form that is available through SLDS. We will demonstrate the process of entering a student's achievement results onto the form. These results will then be stored with the student throughout the student's educational career - even if they transfer to another school or school system. This session is for both the beginner and experienced Gifted Eligibility Form user. Experienced users- please bring your questions, comments, and suggestions. This application is available to all Georgia Public schools. Come learn some useful tips to hold an effective orator's meeting that if incorporated in your classroom will leave your students with an invaluable life skill - the art of public speaking! Participants will learn a fool-proof formula for running an orator's meeting with multiple roles so that each student is responsible for the meeting’s success. Not only will your students learn the components of an effective speech, but also the many essential roles to run an effective orator's meeting. The implementation of Common Core State Standards provides myriad opportunities for differentiation to meet the needs of gifted learners. However, educators may wonder about the best means to address the standards related to speaking and listening. The solution lies in one of the greatest teaching-learning models: Socratic method of inquiry. This centuries-old approach can be used effectively in today’s classroom, in every subject, every grade. The basics of the Socratic seminar that will be presented in this session can be learned in an hour and used throughout a lifetime of teaching. This session will provide the basic “how-to,” with step-by-step guidance in how to set up and conduct a seminar, including a rationale, teacher and student expectations/behaviors, the physical environment and content from specific academic disciplines that may be used in the process of implementing Socratic seminars in the classroom. We all know we need to differentiate for gifted learners, but often do not recognize how differentiation can help us strategically support enrichment, extension and creativity in our classes. This session is designed to make that connection by linking the work of Sandra Kaplan and Carol Tomlinson. Come view graphics that merge these concepts and engage in discussions to reflect on how to apply this information to your classes. GT students need to develop and embrace creativity and effective differentiation can be the start. Creatively use captions from high-quality sources, transforming a traditional close-reading activity into an engaging event, like “The Zombie Zone” and “Sugar Love: A Not So Sweet Tale.” Gifted students will be challenged—and intrigued—as they interact with items you’ve created in this hands-on session from captivating captions. Many schools in Georgia have implemented Renzulli's Schoolwide Enrichment Model and have had great success engaging all students through the use of Enrichment Clusters. Come to this session to learn how teachers in Columbia County are using technology to streamline the cluster selection process. From interest inventories to sorting students, technology makes the process painless! Money is tight and classroom tools are scarce. Engage students by using familiar items in creative ways. In this session, participants will be shown multiple tools that can be made from free materials! Each material has several classroom applications. From egg cartons to paint chips, learn how to use commonly discarded materials to create fun, effective learning tools. Participants will leave with at least one free item! Gifted children’s minds work at warp speed. Thoughts come faster than children can write them leading to frustration and dislike of writing. Capturing high-level thoughts effectively is a skill requiring practice. Writing allows less aggressively-verbal children to process and share deep thoughts, preserves creative novelty, develops brevity, and preserves ideas for sharing & future development. Participants will consider written reflection as an essential element of gifted pedagogy, receive a document used to frame 1st-5th grade critical written reflection of gifted curriculum, learn strategies to build high-level thinking and writing abilities through integrating short critical written reflections after curriculum explorations. Thirty-five years of working with gifted students in Duke TIP summer programs has provided evidence of the nature of the characteristics of gifted/talented students. While individual differences (and exceptions to the rule) abound, there are strong tendencies among gifted kids regarding their social and emotional development that can inform parents and teachers, helping them to understand the response they receive from their children and students. Awareness of these characteristics can turn the “rough seas” of interactions in school and in the home into “smooth sailing” for everyone involved. Que Bueno! … Successful programs for poor or minority children, especially gifted and high ability children, must be multifaceted and flexible. We tend to construct programs aimed at certain groups and at the “typical” low-income minority child. However, in reality there is no typical child, as the circumstances leading to poverty are varied and multifaceted. How can educators help children who are culturally and linguistically economically disadvantaged (CLED) meet classroom, school, district, and state expectations in these times of testing and accountability? Designing programs for gifted and high ability CLED students are vital to creating and fostering a culture of success and equity, especially in high school AP and IB programs. It is never too early to look at your class or school’s data and design appropriate programming options which will afford CLED students every educational opportunity and advantage. Join us as we share the stories- obstacles and successes of programs in CLED districts- small and large. In chronological order through American history, this unit examines positive leadership in politics, science, social justice, the arts, sports, and business. It includes a pre and post test, daily assessments for both content and process, a variety of high impact research based instructional strategies, many primary sources, and technology for instruction and for student products. Science and Social Studies GPS, Common Core Literacy Standards, and Problem-Based Learning projects are integrated throughout. Attendees will leave this session with a complete unit for 11 full days of instruction for grades 4+5. The College and Career Readiness Team at the Georgia Department of Education will present an overview of a decade of Advanced Placement growth in Georgia and will discuss the benefits of Advanced Placement courses for Gifted students, support and training for teachers, and critical areas that need our attention. Come experience math, higher-order thinking skills, and fun in this hands-on math workshop utilizing award-winning math board games in the Muggins Math Series developed by two former Georgia teachers. Games develop not only math skills but socialization skills as players compete in these challenging, multi-leveled games for ages 5 to Einstein! Prize drawing for Muggins/Knock-Out game at end of session. Participants will discuss the basic thinking skills that are part of critical thinking. What does a room full of critical thinkers sound like, look like? These questions will be addressed. Multiple short thinker tasks will be explored. These thinker tasks, in all four core areas of math, language, science, and social studies, get students critically thinking. They can be stand alone lessons or an impetus to a full day's lesson. Gifted learners love to discuss current issues. Creating a curriculum for multiple grade levels is exceedingly easy because one current issue can meet the needs of multiple grade levels when different universal theme lenses are used to frame the discussion. The news is naturally engaging and gives authentic real-world discussion starters for students to create high-level thoughts. Learn easy online resources and leave with a “set of universal theme lenses” that make your current issues curriculum a robust program-wide favorite! E2 Academy teachers will be sharing some of our best lessons, websites, tips and strategies we use to develop critical thinking, creativity, collaboration and communication into our STEM program of choice. E2 is now in our second year and despite challenges we are successfully integrating 21st century skills across the curriculum in an interdisciplinary manner. Our presentation will help you see new possibilities and perspectives; in order to bring creativity to your classroom. Are you looking for a creative, learner-centered, constructivist approach to your gifted classroom? Project-based learning and problem-based learning address this need. Creative problems and projects can serve as the catalyst for jumpstarting inquiry and enthusiasm. Participants will learn how collaboration with creative agencies outside the school system can boost hands-on PBL experiences, too. Give students a new perspective for using creative thinking to solve real-world problems in their community now or extrapolating world issues into the future. The Future Problem Solving Program trains students to use a problem solving process that can be applied within the curriculum, in challenging competition, and throughout their lifetime. This exciting international program meets common core standards and is highly adaptable to many contents, delivery models, and grade levels. Our world needs for students to develop these skills. Bonus: Parent Day Presentation: How can I help my child with math? Many elementary teachers admit that they lack a deep understanding of math and are ill-equipped to teach Common Core standards. In this session, teachers will explore new strategies and tools used to develop number sense and place value, including number talks, non-algorithmic problem-solving, and hands-on activities utilizing tools such as tape diagrams, area models, number disks, and drawings. The presenter will provide teachers with suggestions for enriching and extending math for gifted students and resources, including books and websites. Honors Mentorship in Hall County: A balanced approach to fostering rigor and creativity. This session will focus on fostering creativity in a career-focused mentorships for gifted juniors and seniors. You will see how to use blended learning approaches for students, while still providing a curriculum that is rigorous and fosters creativity for the individual. Participants will learn about curriculum approaches used, management of the program using technology, and see student outcomes for those who have successfully completed the program. Join us to see the amazing opportunities afforded gifted students in this program! CogAT Form 7 reflects the most up-to-date research on how best to measure cognitive abilities and learning styles. CogAT 7 introduces a variety of enhancements, including new item types, a reduced language load to make the instrument even more appropriate for ELL children, an expanded instructor support package, a choice of methods of administration, and more. Demonstration of the new online administration and reporting options to understand how to best identify cognitive ability and learning style. Richard Cash, PhD ~ nRich Educational Consulting, Inc.
From exaggerated expectations to a fixed mindset, gifted youth are impacted by stress and anxiety. Neuroscientific research has revealed the negative impact of stress on learning for all students. For gifted youth, the outcomes of unmanaged stress can be devastating both emotionally as well as educationally. This session will frame the causes of stress and provide strategies to reduce its effects. Be prepared to participant; we will work through traditional types of relaxation techniques as well as get silly to reduce anxiety. Participants will receive a list of resources to assist gifted youth in managing stress and anxiety. Helping Students Discover Their "Element"
I believe THE most important work accomplished in a classroom is a young person discovering their unique ability, talents and passions. It is important to help our students develop a vision for their future and the confidence (and willingness)to explore opportunities. My interactive presentation will offer participants new perspectives, engaging lessons and resources to help young people discover their strengths and passions. Performing Arts and Drama forces participants to solve problems creatively. Integrating Performing Arts and Drama into classroom curriculum, delivery and products can assist in the development of student creativity. In this presentation, attendees will learn the theory of an integrated performing arts classroom. Further, attendees will receive a practical guide in creating such a classroom environment. Do you want to inspire your students to create authentic projects that weave their interests with ELA, Technology, and Science standards and then add Service Learning and Critical Thinking components? Leave today with everything you need to facilitate middle school projects that will motivate your students to learn and create! A panel of teachers and middle school students will detail their journey of creative, inspired learning and then answer your questions! Odyssey of the Mind is a creative problem solving competition for problem solvers from 5 to ? Odyssey of the Mind is a creative and innovative way to address state and national standards while having FUN. This hands-on for kids and hands-off for adults program helps students look for the question behind the problem to create multiple solutions. Participants will learn how to guide students through the process of inquiry. Student inquiry has the possibility of opening minds to unexplored worlds through wonders, research, trial and error, and communication skills. Wondering can encourage natural curiosity and classroom engagement. Students can greatly benefit from this hands-on learning experience and take ownership of their own learning. These students can help build lasting curiosity in their community and become the leaders of tomorrow. Your gifted students often need experiences beyond the traditional K-12 classroom. Join a conversation about the many resources that are available through partnering with university systems and other programs tailored to meet gifted students’ academic needs. For middle and high school age students, the opportunities range from supplemental instruction to summer programs to full-time residential programs. Learn how to navigate the options and determine the possibilities for your student. Internships That Change Their (and Our) Worlds: Infusing the Career Internship with a Curriculum of Creativity! The high school gifted internship course proves to be the pinnacle of the K-12 gifted education experience when viewed through the lens of the creative learner! Borrowing from Gardner's Creating Minds, Maslow's theory of the creative personality, Renzulli's Multiple Menu Model, A Parallel Curriculum (Tomlinson, Kaplan, Renzulli, Purcell, Leppien, Burns 2002), the CPS matrix (Treffinger and Isaksen), and studies in epistemic cognition (Costa), this presentation demonstrates how to infuse an internship program with a curriculum of creativity. The end product is career defining and life changing! This session featuring Matthew Mugo Fields, President of GiftedandTalented.com, will explore the complex educational needs of gifted learners and explain how innovative educational technology, along with decades of Stanford research in the area of adaptive learning, can be used to meet gifted student’s needs and insure they reach their full potential. Improv and creative dramatics is an enjoyable and effective way to build communicative language, critical reasoning, creative thinking and problem solving skills. It can also be a great way to build the self-confidence of gifted learners, because there are “no wrong answers.” Join Dr. Cash, an academic and theater trained teacher, as he takes you through interactive practices of improve and creative dramatics. Participants will experience how gifted learners can become more self-confident, expressive and articulate through improv and creative dramatics. My Favorite Day of the Week: How to creatively design a gifted resource environment where students thrive and teachers survive! What makes a gifted resource program a student’s favorite day of the week? How do you personalize and organize a large gifted program where each student thrives and the teacher survives? Ideas we will share include student organization, parental communication, and activities to meet the affective needs of students. Gifted resource teachers will have time to collaborate in this session to share successful ideas. Participants will learn how to engage and motivate gifted learners through "Brain Bites" a year round student choice program that can be used to supplement a gifted resource pull-out program. By giving students a choice in assignments it boosts their creativity and motivation (Lasley, 2013). The activities in Brain Bites focus on the common core state standards and are crosswalked with the gifted strands. When we teach to student's strengths and interests we promote creativity and critical thinking. Mock trial allows students to assume the roles of attorneys and witnesses as they learn about the judicial system. As students study materials and develop a case, they practice critical thinking, creative problem-solving, fact-finding, and public speaking. In addition, they learn about relevant legal principles and the role of the government in making and enforcing laws and protecting the rights of individuals. The presenters will share ideas and resources for implementing mock trials for gifted students. The Advanced Scholars’ Program at Friendship is an innovative approach to achieving growth within our gifted/higher students. In this program the 9 weeks curriculum is compacted into a 7 week instructional period. The last 2 weeks are reserved for student chosen, project based inquiry that is designed to take the curriculum taught much deeper and make it more lasting and impactful for the students. In this session, we will be doing a brief overview of what the program is, how it is designed and lessons learned from our first full year of work. Enrichment Clusters enable creative productivity to blossom in all segments of a school’s population. Our school, Luella Elementary, has been engaged in this endeavor for the past two years with outstanding results. From inception to implementation, this session will take you through the process of successfully developing school-wide enrichment clusters without outside funding. This presentation is based on the ideas and principles of Harvard’s Project Zero Classroom. It will focus on several of the strategies and activities that are used to integrate the development of both creative and critical thinking into the upper elementary and middle school classroom. These strategies developed by Howard Gardner, Dave Perkins and other researchers are techniques that can easily be integrated into your everyday classroom instruction. Participants will be actively engaged in several hands-on activities you can take back and use with your students tomorrow to help develop divergent thinking skills. Through the use of art and mechanical objects students will begin considering the contradictions and relationships that exist around them. Through these fun and engaging activities, we have been able to enrich and enhance the reasoning and problem solving skills our 4th and 5th grade gifted students. In schools both at the local and national level, culturally and linguistically diverse or low-income students are underrepresented in gifted programs. In many of these gifted programs, educators and parents who advocate for equity are faced with negative attitudes, unbalanced access, inappropriate assessment, and/or insensitive accommodations. As a result, recruiting and retaining students from under-represented groups in gifted programs remains a challenge. This session is devoted to highlighting key findings from a partnership called U-SPARC (University-School Partnerships for Achievement, Rigor and Creativity) between a team of faculty and students in the Gifted and Creative Education program at the University of Georgia and a local Clarke County School District elementary school. Panelists will highlight ways in which structures designed to establish the partnership help to increase sustainability and advance equity and excellence in school. Come have a cup of coffee or tea with Gail Humble, Gifted Education Specialist for the Georgia Department of Education. This session will offer participants an informal setting to discuss the education of high-ability and gifted learners in Georgia. The session will also provide opportunities to network and problem solve with other professionals who have similar interests and challenges. The Gifted Teacher's Depot: You Can Do It. We Can Help. This workshop will provide great tools for building an extraordinary elementary gifted classroom. Not your ordinary tools...but we will present a variety of tools to enhance the use of technology, communication, collaboration, creative and critical thinking, and problem solving. Some tools included are: STEM, Lego Engineering, Interdisciplinary Units, engaging web tools, research methods, CPS, and much more. Join us in filling your "Gifted Teacher Toolbox". Session participants will learn how to engage gifted students through a collection of object-driven logic riddles designed to promote critical thinking and problem solving skills for all ages. They are fun and challenging puzzles that require students to think about what's in the box or should we say "think outside the box". The object-driven riddles can be used to teach: listening skills, divergent thinking, associative thinking and inference. Through these riddles students will learn to recognize important ideas, clues and to examine ideas from different points of view. Tired of notebook paper littering your desk waiting to be graded? Do you want to convert your classroom environment into a paperless student-led class setting? Participants will receive technology tools that can improve student and teacher creativity and communication. The tools will help enhance instructional interdisciplinary connections, integrate engaging teaching strategies, and help differentiate the learning environment. The participants will gain a connected classroom guide to flipping their instruction, which supports nurturing the creative nature of many gifted students. "Do the questions at the end of your chapter." That’s in no way to engage gifted students! Storytelling, inquiry and hands-on science will though! And inquiry based science does more. It develops skills that foster creativity and innovation. Come prepared to have fun and learn lots too! This presentation looks at traits of gifted innovators. Many of these traits can be enhanced. And, the very things the Quirkles® teach—through integration of inquiry-based science and literacy—helps develop those skills. Who knows? You may be nurturing the next Steve Jobs! The Six Thinking Hats tool developed by Dr. Edward deBono is used to teach creative and critical thinking in all content areas. In this session, participants will learn about Dr. deBono's powerful thinking strategy and how it can be utilized in the classroom. 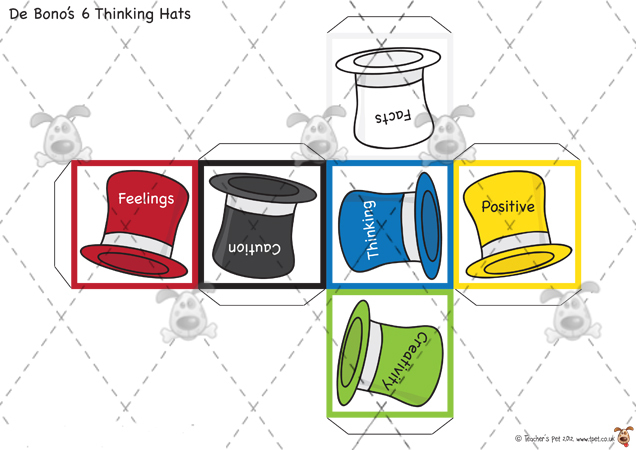 The six colored hats can be used to help students see things from a different perspective and allows for more creative thought. Teachers will walk away with a new perspective and resources to use in the classroom. Why are classroom discussions such an attractive, yet daunting classroom strategy? When it comes to classroom conversations, the full classroom, one-size-fits-all model is not the only mode of discussion. There is an art and a science to choosing pairs, small groups, and large groups for varied topics, no matter your content area. This active presentation requires participation, so get ready to immerse yourself in new strategies to take home to your classroom. invited to join the GAGC Local Chapter Chair, and other Local Chapter leaders for this opportunity to swap ideas, discuss concerns, and share tips, tools, and techniques for starting and/or sustaining enthusiasm and support for your Local Gifted Program and Association Chapter. Many educators want to collaborate with universities to support gifted education programming, yet few are successful sustaining engagement with students. Project U-SPARC (University-School Partnerships for Achievement, Rigor and Creativity), represents targets for local school improvement initiatives that aim to increase student achievement, enhance rigor in the curriculum, and develop creative potential in students. University of Georgia faculty and students and Stroud Elementary administrators and teachers work together in a freshman seminar designed as a service-learning course where students gain experience with local schools, community groups and organizations to develop talent among ethnic minority youth and close the achievement gap. Normally developing gifted and talented students have social-emotional needs. The problem is, they may not have the skills and abilities to recognize and cope with them. This session will focus on identifying these social-emotional needs and providing applied strategies for teaching and nurturing their development. Participants will learn how to effectively use technology to enhance student opportunities for creativity. Presenters will share various apps and web-based applications that can be used in the classroom to promote creativity and problem based learning as well as meet curriculum standards. Williams (1969), Stahl (1980), Nilsson (2012), and the revised taxonomy of Bloom (2001) give the creative thinker frameworks to evaluate his or her own creativity. The authors have collectively taken the taxonomies and combined them with specific questions into a rubric to provide the creative thinker with a contrivance for evaluation. This session will demonstrate how the rubric can help gifted and talented learners better explore their creativity. Chess is a great way to present students with challenging problem-solving activities. Even with no chess experience, you can challenge bright minds to solve problems that address complex spatial tasks and relationships, provide collaborative or competitive challenges, and allow students to intuit and explain reasoning. Are you looking for a way to increase rigor, engage students and and work less? If the answer is yes, Animation Nation is for you. In this session Kia will share how she utilized Stop Motion Animation, Digital Animation, and Web 2.0 websites to reach minority gifted and non gifted learners. Through project based learning geared towards producing original animations, she saw increased student engagement, academic competition winners, and an increase in gifted identified students. Experience interactive learning stations first-hand. Participants will be exposed to several different strategies to foster creativity and independence in the classroom. Fluency, flexibility and originality will be highlighted through the use of technology, open-ended questioning, and group collaboration. Guidance will be given to develop rigorous activities to meet the needs of individual classrooms, including creating research based infographics, utilizing elaborations with non-fiction texts and innovative problem solving. Solar energy is vital for humanity’s future, yet its fundamentals can be confusing to students. Explore hands-on methods to integrate waves, circuits, and energy through classroom demonstration and lab activity ideas. Free NASA resources and access to “Sun Power for Schools” lessons. This workshop is conducted by a NASA Astrophysics Educator Ambassador and science teacher at Jasper County High School. It was developed in conjunction with Georgia’s “Sun Power for Schools” program of Green Power EMC of Tucker, GA.
Brittany Anderson, Octavia Fugerson, Meg HinesPh.D., Tarek Grantham Ph.D. It is often said that Twice Exceptional students take twice the effort and cause twice the headaches. However, they often deliver twice the product when directed. This session will focus on applied strategies for teaching the Twice Exceptional student to succeed. The goal would be to develop a skill set that the student can use flexibly and independently. hnology, and teach across the curriculum without breaking a sweat. Students will remember and be able to apply their learning after they know learning matters in the creation of products that are based in relevant real world projects. PBL is a research based, kid challenging, and teacher approved approach to content areas and student growth. A new perspective on the role of wellness and physical activity in our school has transformed our culture. Our goal: increase physical activity for students before, during, and/or after school for 30 minutes every day. The outcome: increased brain activity translating into the ability to think more clearly and a healthier, high achieving school within a healthier community. Come learn how we shifted our thinking and creatively used our time/resources with significant results! Looking for alternative ways to document Creativity, Motivation and Mental Ability in students from underrepresented groups? The strategies presented in this session support production of student portfolio artifacts which document these abilities for referral and evaluation of students for gifted program placement. The session will include examples of how strategies are applied in class sessions with students. Also, I have attached a registration link to two workshops we will be doing at the Federal Reserve Bank of Atlanta on April 30th and May 1st. We are partnering with the Georgia Council on Economic Education for these two workshops, so you will be provided with reimbursement for your substitute teacher. Please take a look at the registration pages to find out more details. Feel free to email me if you have questions! Your students face choices every day. Each of these choices involve costs and benefits. Help them become better decision makers with resources from the Federal Reserve. In this session, you will discover a treasure trove of free lessons, print materials, and digital tools you can use to engage your students in economic thinking. Our lessons and materials are aligned to K-12 standards. Each participant will receive a bag of educational materials and a flash drive filled with electronic resources for the classroom. How big is big? How small is small? Help students understand the concept of size scaling and powers of ten as we investigate the Universe. A presentation of recent NASA missions searching for distant objects will preface a hands-on activity using photo cards to sequence objects from the subatomic to the astronomical. Participants will receive a free copy of a 64-page Scaling and Powers of Ten activity guide, as well as various NASA mission materials. Heroes Matter is a non-profit educational initiative empowering kids to make their world a better place through creative problem solving and storytelling. In this service project based learning program, students will read a mentoring text about heroes in Haiti and will then write and illustrate a hero adventure of their own, using creative problem solving to address global issues. Curriculum is available allowing students to fulfill core requirements in literacy, social studies and science. Kristin Siembieda is involved in the first pilot of the Heroes Matter initiative, using it to teach writing, art, social science and science and involving STEM projects. Along with non-profit director, Laura Martin, they will present exciting results from this project, showing students actively engaged in learning that forms the foundation for creating global leaders who have the capacity to bring creativity and effectiveness to address environmental and social issues. Meg Hines Ph.D., Stephanie Franks, Octavia Fugerson, Brittany Anderson, Jeremy Pina, Sarah Marie Catalana, Jeremy Pina, Tarek Grantham, Ph.D.
Teachers advocate for increased engagement by advanced students from under-represented minority groups. In the partnership between the University of Georgia’s Gifted and Creative Education Program and a local school, teachers, graduate students and faculty helped to establish a Community Problem Solving (CMPS) team of twelve, fourth grade students. In Community Problem Solving, students are challenged with using the six-step creative problem-solving model to identify, solve and carry out a plan of action to address a problem in their community. Project members will highlight how they used professional development experiences, student data and Mary Frasier’s TABs instrument to upstart the team, as well as, key supplemental CmPS activities for the team of students. Avoiding Educator Burnout: Who Ya Gonna Call? Stress Busters! Educator Burnout is a serious problem in Talented and Gifted Educators. The success of your program is often dependent on you and that puts a lot of stress on you. This session will focus on realistic things you and your colleagues can do to avoid burnout and remain creative.